So just to get this straight…this is not another block to go with the first…this is in place of the center wool appliqué block that was posted earlier. Some people are allergic to wool…some don’t do wool appliqué? 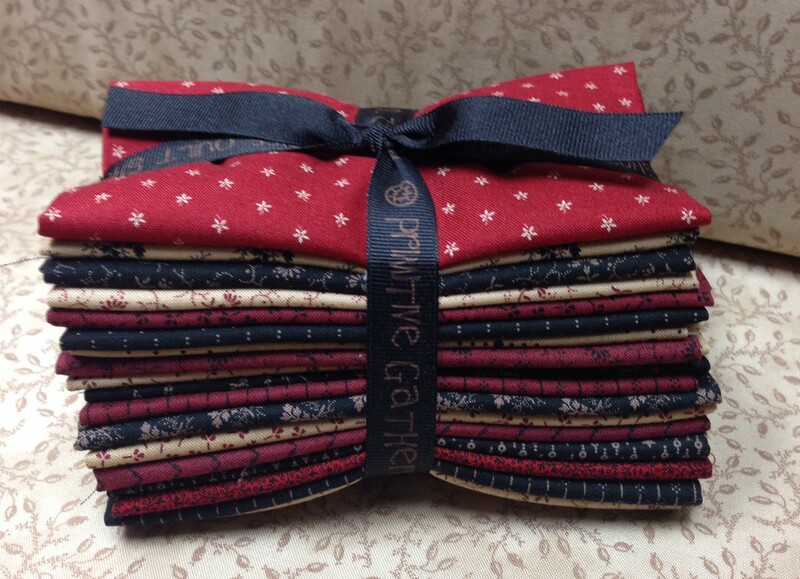 What’s wrong with that?…lol…so this is their center OR you can make 2 Stitch Along quilts!!!!! 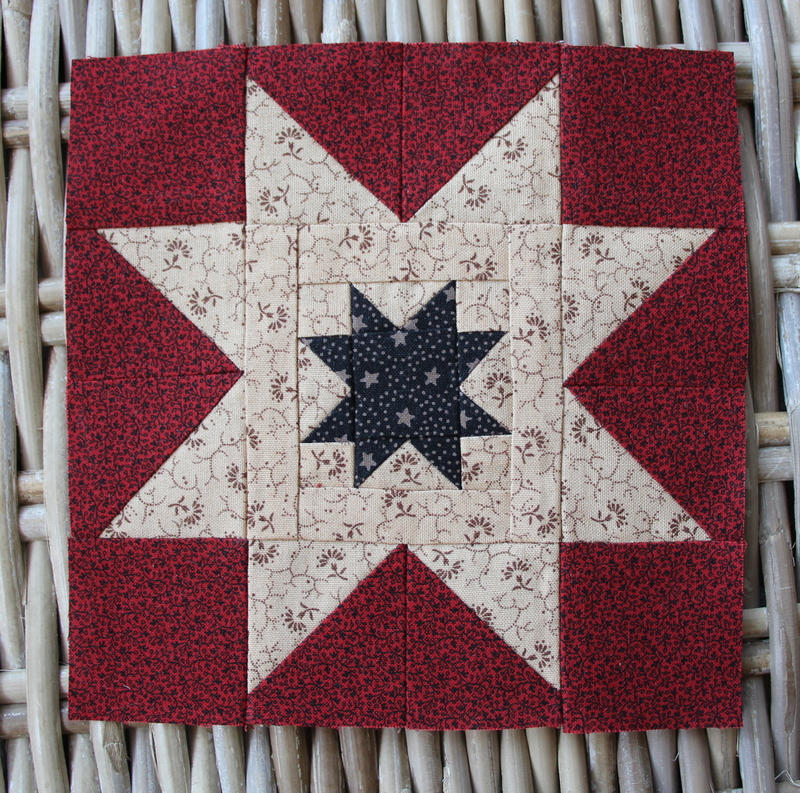 Now for PART 2–remember the deal…If I have to write the directions…You have to read them….all the information on the piecing of the block is in these PDF directions…example…What to cut your appliqué block to? It is in the PDF! Here is the actual wool block. 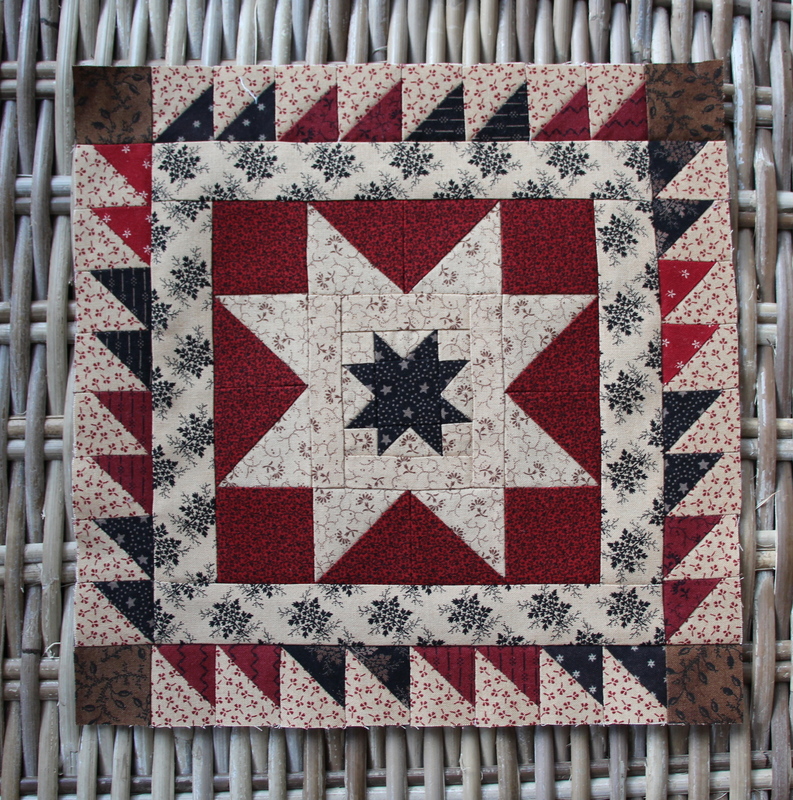 Now here is the pieced version with Part 2- The piecing will be the same for each version unless I specify in separate directions for the blocks. Do you like them??? If am super excited and want to start stitching the next round!!! Please remember to be patient with this Stitch Along stuff… I didn’t expect this to be what it has become and our girls have a lot on their plate with our normal orders and our block of the week event…We are a little company and cannot compete with Amazon and their shipping times…. so what I am saying is please be nice when calling or emailing…we want you to get your stuff, we purposely are not holding yours hostage to make you mad…we want to please you and we appreciate all of our customers…if something isn’t right we will figure it out and get your your quilting goodies!!! Now I wish you all a Happy 4th of July and hope you make it FUN! I am loving BOTH versions, Lisa. Hmmm–there just isn’t time, but, oh, how I want to do them both. Thanks for what is already shaping up to be a wonderful design. I got a chuckle about your plea for people to be nice to your girls. It isn’t funny that people are rude to them and it is sad that you even have to ask people to be nice, but I love that you are in there going to bat for them! Hey Janet O…how are you in Utah…You (especially you) are going to love this…just saying…can’t wait for you to see how it turns out!!! Hi, Lisa! Things are great here in Utah–but HOT! Unlike the frigid air when you were here. Okay, so I got my wool center block done last night and I absolutely love it! Hoping to piece part 2 today–and am trying to tell myself I don’t need to do both versions. That conversation is getting heated. Where do we send photos of our blocks when they are completed? Oh my gosh, this is FABULOUS!!!! I love. love, love the border around the wool center! 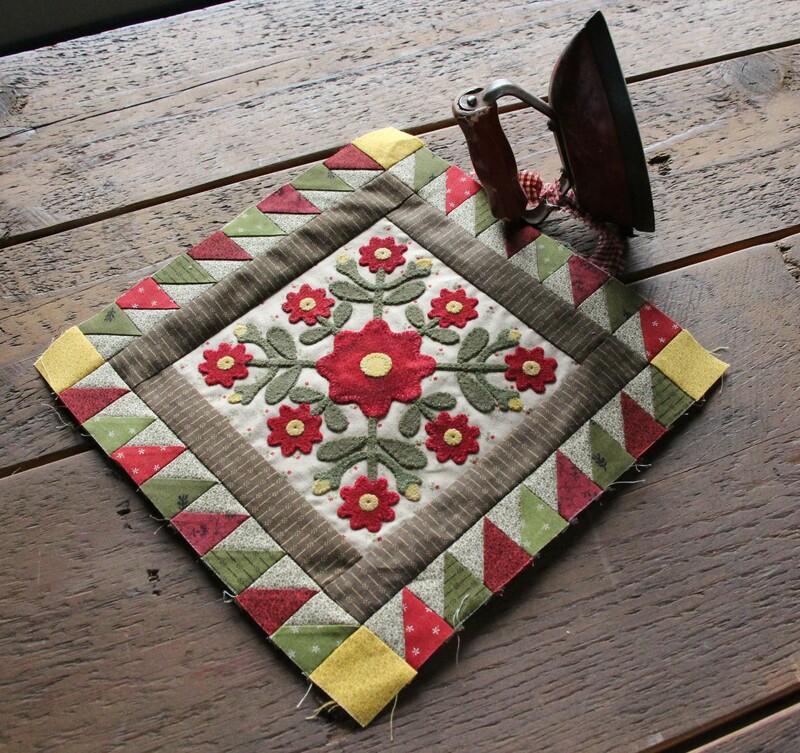 But I can hardly wait for another wool applique block! I’m afraid I’m getting a little obsessed… Thanks so much for all you and your employees do! They are so helpful and patient! It’s all just so amazing it is hard to wait for the next installment. Thanks again, and Happy 4th! So excited to see part 2 – love it! Thank you! I am loving this little side project. Linda…I am sorry for your confusion…I never said I was doing ALL wool blocks…I presented the one…and said I was going to continue to add on to this…there will be more wool, but there is piecing as well. I will add on to the half square triangle border for Part 3….I forwarded your request on to the shop to discontinue your shipments. I love the pieced center, really great. Thanks for all of the time you take to make us happy. You rock!!!!!!! Thank you Lisa for all your hard work you put into everything you offer us! Everything is wonderful and I just can’t wait to do it all!! Thanks Lisa for taking the time to share this fun stitch along! Considering doing both versions…I was looking for a red, white and blue project! Do you happen to have mind reading skills, on top of your many other talents? Have a happy 4th! Oh, I’m so excited! I so appreciate your talent, sharing and hard work. I’ll send pictures… This is fun! Thank You! Love The Blocks And Colors!! From BARB CUTLER….PART 1….Thank you!! VERY fun! Hi Lisa, I am doing the sbow and would like to have the thread list for it. I have looked on the web site but couldn’t find it and I also called the shop and was told to look on the web site or call back another day. Can you help me with getting the list? Lisa, I LOVE this stitch along! Thank you for all you do for us quilters! We all can’t do the designing and depend on you creative gals for that. Lisa, I’m a little confused. I would like to order the fabric bundle. Can this be used for the wool block too since the colors seem more like for the pieced block. What a great idea and a fun project for us … thank you Lisa! Thanks to your amazing staff! So excited and happy with part 2 of the SAL. I’m almost done with the SBOW 2013 and can’t wait to start the 2014 SBOW. However, with the SAL, I’m having a hard time deciding what to work on next. I think I will have three of your projects going at one time, since they are all so beautiful. Thank you again for all of your hard work you do for all of us. Also, thanks to all of your employees for the work they do too. It really must be a nightmare during the summer months for all of you. I will see you in a couple of weeks for a workshop in Michigan and I also can’t wait to start that project and be in one of your workshops…I hope I live to be 100 yrs. old b/c I can’t stop working with your wools and beautiful projects…love all of them and all of you that make these things happen for all of us. Thank You so much for the pieced version!! It was worth the wait, can’t wait to get started. Love, love, love! Not confusing, all very clear. And your little company is doing GREAT, thank you!